The Decalogue is mounted on a curved wood beam. 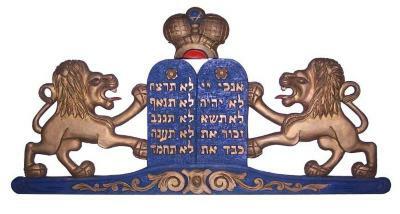 On each side there are lions standing on their hind legs holding the tablets, and centered above the tablets is a crown. The tablet ark decoration was used during the Downtown Synagogue’s tenure in the Enquirer building. The Downtown Synagogue had its origins in the Congregation Beth El, which was housed in the basement of the Mount Street Temple. For many years, under the Rabbinic leadership of Rev. Nathan Richter, it was housed in the Enquirer Building. The Downtown synagogue was housed in the Bartlett building until it closed its doors in 2003.